PHOTO COURTESY SONY PICTURES CLASSICS A still from "The Gatekeepers." In the Oscar-nominated documentary "The Gatekeepers," a gripping recounting of the history of the long-standing Israeli-Palestinian conflict, Israeli filmmaker Dror Moreh has achieved a remarkable feat. 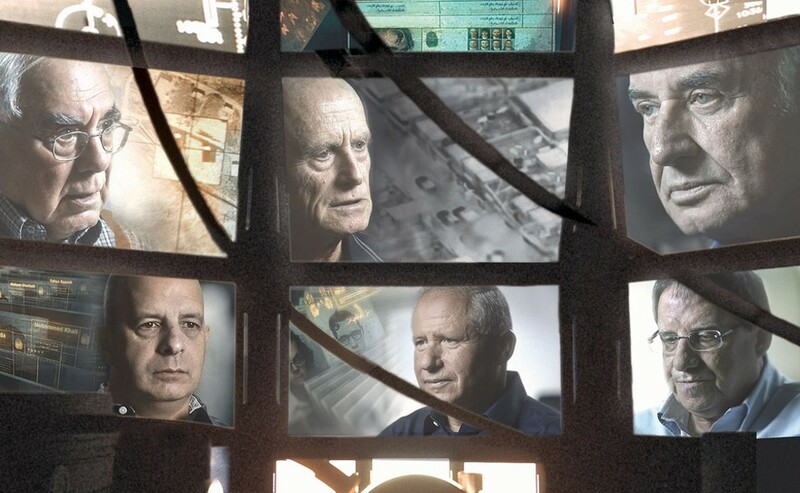 Not only in creating a powerful, passionate, and clear-eyed examination of an exceedingly complex subject, but in miraculously convincing all six surviving former heads of Shin Bet, Israel's secret internal security agency, to be interviewed on camera, for the first time ever. The men are each given the opportunity to talk about particulars of their job, going into detail about specific operations and events. They discuss their successes as well as their failures, including the 1984 Kav 300 bus hijacking, in which Shin Bet officers brutally executed two of the perpetrators immediately after their capture, as well as the assassination of Prime Minister Yitzhak Rabin in 1995. Given their histories, it's often shocking how, given the gift of hindsight, each man has evolved beyond the black-and-white ideology that their job required, and learned to see the situation as it truly is: an endless landscape painted in nothing but shades of gray. "When you retire, you become a bit of a leftist," as one explains it. Over the years, most seem to have grown increasingly critical of Israel's tactics, and several even express their full support in granting Palestinian statehood. Occasionally Moreh's interviews take on the tone of an interrogation, prodding and applying pressure to his subjects when they threaten to clam up. But for the most part all six men seem perfectly willing to talk, and they all come across as thoughtful and complicated individuals. Listening to them speak about the morality of participating in government-sanctioned violence in the name of achieving peace, one can't help but wonder if these interviews were something of a relief, giving them the chance to open up about the things they've done and seen, after years and even decades of silence. It's still more than a little chilling to hear them talk about using targeted assassinations, weighing the consequences of taking out a supposed threat against the collateral damage of possible innocent lives lost. At one point or another, all express longing for the clarity of a "clean" operation that doesn't require such choices, and regret for how rarely those easy decisions present themselves. Clearly, the costs of those choices weigh on them all. Considering that those choices continue to be made, on both sides of the conflict, it's not at all surprising that all the men remain pessimistic about prospects for peace in the future. "The future is very dark," one admits late in the film. Moreh has crafted a stylish and compelling film, and he's fond of utilizing impressive 3D location modeling throughout the film as a means to provide his audience visuals for certain events that lack archival footage. These flourishes are sometimes an unnecessary distraction during the interviews, especially when the words in and of themselves are so riveting.